Welcome to our Boutique Hotel Corona. We are ideally situated in the Buitenhof area, the city centre of The Hague. The ideal starting point to explore the city. If you’ve come by car, leave it in the parking garage Museumkwartier, because you’re at walking distance of the Mauritshuis, Binnenhof (Houses of Parliament) and ‘het Plein’ (the Square). The Scheveningen sea is only a 14-minute tram ride away from the hotel. The stop is at 200m walking distance of the hotel. We want you to feel at home with us, as much as you possibly can. Whether you're out on a romantic weekend with your partner, on a shopping spree with friends, visiting a multi-day international conference at the World Forum or if you come over to have dinner with us.... Whatever the reason for your visit may be, we will do everything to make sure you will enjoy your stay. 24 hours a day, 7 days a week. The boutique hotel is located in three 17th century buildings. If you look closely, you can still see the three different facades at the hotel entrance. Naturally we have preserved all the beautiful details: the high ceilings on the ground floor, amazing chandeliers, but also the vaulted cellars. However with our renovation in 2011 we have made sure that our boutique hotel even better meets the standards and needs of travelers today. We offer contemporary comfort in an elegant setting with our personalized service. B.I.T. Grill & Café is a steak restaurant at Buitenhof near Hotel Corona. Visit BIT (Best In Town) for breakfast, lunch, business lunches, coffee and dinner. Thanks to its location in the The Hague city centre, the restaurant is also an excellent place to dine before a theatre performance or visit to the cinema. The Pathé Buitenhof cinema is directly opposite B.I.T. Surprise your loved one with the ‘Royal Love' package. Unprecedented luxury and relaxation. You will have plenty of time to explore the city, have an intimate dinner together and really spend quality time together. It’s up to you to decide if you want to stay in our deluxe suite with jacuzzi, the spacious Superior Room or our cozy Deluxe room. Starts at € 130,- per room, per night, excluding city tax. At the end of the 16th century the Buitenhof was still an unpaved forecourt of the Parliament and there were mainly members of the royal household of the Courtyard. Early 18th century established "Coffee Huys Van Dalen 'in the middle of the three little houses, which now form Hotel Corona. 50 years later, in 1783 it officially became a hotel named "The Amsterdam Stock Exchange. Between 1818 and 1919 the three small buildings used as office space, shops and even a bank. Owing to the location, in the center of The Hague, was yet again opted for a hotel in 1921. A single night then cost only 3.50 guilders. After World War II there was a new manager and the hotel got it's name Corona. If you look closely, you still recognize the three different facades where the hotel is made. 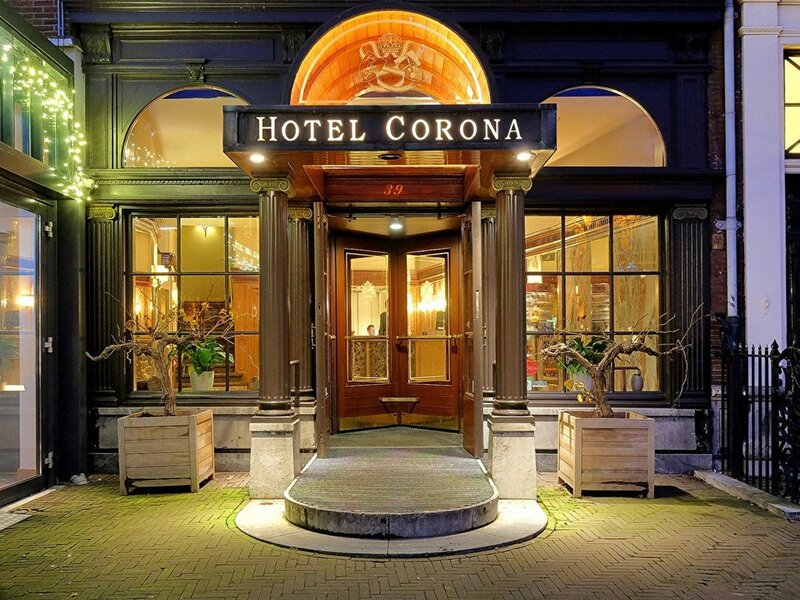 Corona is the oldest four-star hotel in The Hague. The ground floor has beautiful high ceilings and large chandeliers and under the building are still old vaulted cellars where the wines are preserved to this day.